Calus, the program also works well with other readers bar code, but we wanted to adopt a simple to use, and especially powerful in doing its work: read the barcodes EAN 8 and 13. Our eye has fallen on a device of Datalogic and released a short time ago, this is the QuickScan I QW2100 Lite. We tried this reader barcode with our program in either serial keyboard and everything was simple to set up and especially quick to use. 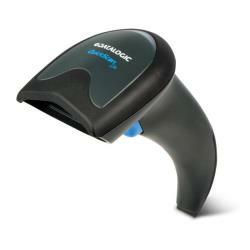 With the sensor imager device reads virtually any barcode, even those printed on transparent surfaces or crumpled paper. There’s no comparison with respect to the optical devices and lasers. We recommend that you use the player with Calus in serial mode as it is not mandatory to have the focus on the field of barcode.